In addition to having traveled the world coaching surfers of all levels in New York & Puerto Rico, Elliot has a particularly intimate understanding of the New York & NW coast of Puerto Rico surf conditions as well as the strategy and equipment needed to excel as a professional surfer. My goal as a professional surf coach is simple: to help you become the best surfer possible. Surfing doesn't need to be as complicated as many say it's become. I understand there are constant small adjustments which requires a deep understanding of one's natural tendencies and habits. Even the best of surfers need another set of eyes from time to time. I provide those open invaluable eyes through a broad range of teaching specialties including one-to-one teaching, group instruction, and video analysis - which means I am able to custom-tailor surf coaching and instructing philosophies for each of my clients. As a professional surfing coach, Elliot Zuckerman has coached many surfers over the years, optimizing their surf-abilities in the water and challenging them to surf at a new level. My professional surf-coaching program will improve your confidence and skills; increase your wave knowledge and help you to improve faster and reach your personal goals in surfing. Experienced surf coach, Elliot Zuckerman will conduct a thorough evaluation of your current surfing level and work with you to identify you strengths and your weaknesses while setting specific goals to address the areas most needing attention so you may rapidly improve your level of surfing. This ensures the boards you are riding are optimal for your weight, ability, conditions and surfing style. Having the best equipment possible is the cornerstone to maximizing your performance and surfing potential as well as developing confidence for all surfing conditions. Working with Elliot as your professional surf coach, who over the course of 45 years has developed an acute understanding and ability to help fine tune board quivers, you can be confident your equipment is optimal for your distinct surfing style and wave conditions. Proper body positioning and technique may be the most important skill you learn working with Elliot as your surf coach. If you have a good basic surfing foundation the rest will come much easier for you. Advanced maneuvers will come more naturally when you are consistently implementing the basic body positioning and correct techniques. Reading waves is also a basic skill some people never fully understand. You will learn about how different swell directions can make waves break differently along the same reef or sand bottom and how to find the best waves in your session. As a competitor you will be scored by a panel of judges. The role of a judge in a surfing contest is to decide which surfer performs the closest to the "judging criteria" in any heat. The fundamental importance of the criteria is that each judge understands what he is looking for from the surfers. At its most basic level, contest strategy is simply designed for your surfing performance to coincide with the judging criteria of the particular heat. We recommend at the very least three coaching sessions in order to thoroughly evaluate and implement the new strategy in a sustainable regiment. Thank you for considering Professional Surf Coach Elliot Zuckerman in assisting you with your surfing aspirations. Please do not hesitate to contact me directly if you have any questions. 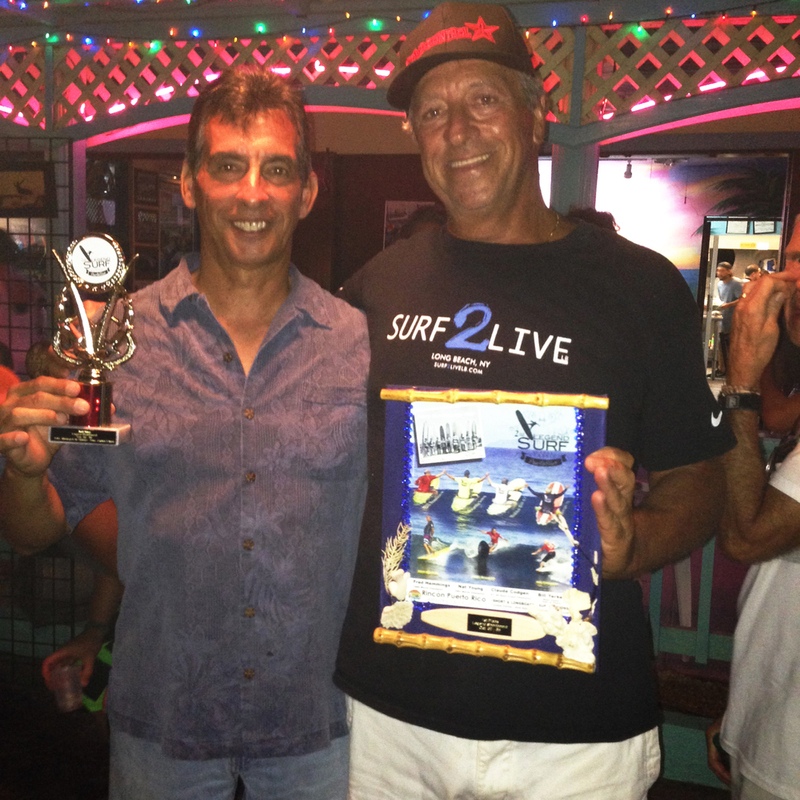 ELLIOT ZUCKERMAN TAKES HOME "LEGENDS FIRST PLACE" (shortboard category) at Domes, Rincon, Puerto Rico, January 2015. In the second annual LEGENDS SURF CONTEST PUERTO RICO, Elliot nails the first place position! Learn more about the legends here. Elliot, next to Australian surf legend, Nat Young, below.